Explore the hidden corners of Lecce and meet a local artisan for a papier mâché workshop during this walking tour. 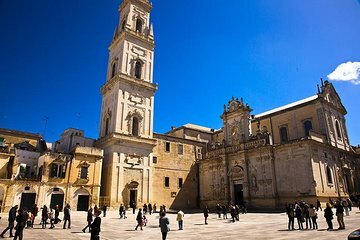 Maximize time spent in Lecce with an itinerary that includes the top landmarks in the old town plus a tasting of local products such as cheese, salami, and gelato. Learn about papier mâché techniques during a workshop in a typical atelier. Our tour guide Sonia was wonderful. We saw so much more it our limited time in Lecce then we ever could have on our own. She was very knowledgeable and made sure she worked the tour around our constraints! The best part of all was the papier-mâché workshop. We had so much fun and our finished products will be a lasting memory of our travels. This was the most fun part of our trip. Because we were a bit far from the tour start, they picked us up with a pedi-cab for no extra charge. We booked the tour because we knew nothing about Lecce and wanted a quick orientation. Our guide was a knowledgeable young woman who clearly loved her city. She is doing her thesis on the facade of Basilica di Santa Croce. We had jet lag so we under utilized her knowledge and had to shorten our tour to pick up a rental car. She graciously took us as far as she could to the pick up point. The stop on the tour where we made paper machete Puglians the most fun. The shop owner was very enthusiastic and made sure our projects turned out respectable. Our figurines are our favorite souvenirs of this trip. If you like crafts and are handy, I highly recommend this experience.